Over the last 30 years, the development of new technologies and advances in clinical procedures have led to a steady integration of implant dentistry into daily practice. Dental professionals have had to broaden their range of skills in order to provide patients with the highest standard of care. Education, however, has placed little emphasis on the identification of the degree of complexity and risk involved in individual procedures. This presents clinicians with a significant obstacle in their undertaking to provide patients with optimal treatment. In response to this situation, the International Team for Implantology (ITI) has formalized a system of classification for various types of dental implant restorative and surgical procedures to support clinicians at every level of expertise and experience. This tool is based on the debate and findings of an ITI Consensus Conference attended by a multidisciplinary group of 28 clinicians that was held in Mallorca in March 2007. It provides guidelines to a broad variety of implant situations for both restorative and surgical cases, which are classified according to three categories: straightforward (S), advanced (A) and complex (C). This is an indispensable reference tool for all practitioners when making decisions regarding to the selection of individual treatment approaches. The clear descriptions and classification allow clinicians to assess the degree of complexity and risk involved in individual cases and the relevant skills required to provide the treatment. “The SAC Classification in Implant Dentistry” (ISBN: 978-1-85097-188-7) can be purchased or ordered in selected book stores or directly from the Quintessence Publishing Group. The SAC Assessment Tool distills the content of this book in an easy-to-use process that takes the user through each step necessary to identify the degree of complexity and potential risk involved in individual cases. Dental practitioners can thus better match cases to their skills and level of experience at the same time as developing their knowledge at a theoretical level. By making this tool publicly available, the ITI underlines its commitment to quality assurance in implant therapy with the objective of ensuring best-possible treatment for patients. Please click here to start your SAC assessment (requires Flash player; depending on your connection speed the application may take a while to load). 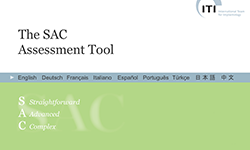 The ITI SAC Assessment Tool is now also available as an iPad app and can be downloaded at no charge from the Apple App Store. Dental implants: Will I have enough bone after tooth extraction? This entry was posted in All, Dental Implants, Periodontist, Publications. Bookmark the permalink.